The Color Management Group is now offering this premium GRACoL® proofing media. This paper contains optical brighteners (OBA's) and matches the paper color for GRACoL® specification. At 250gsm this media has virtually no see-through with a 95% opacity. If you are looking for the premier GRACoL® 2013 media - look no further! 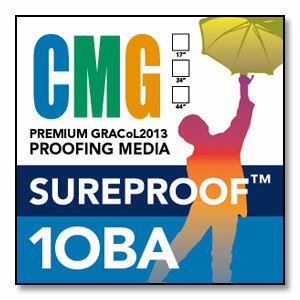 CMG SureProof OBA is manufactured to meet or beat original equipment manufacturer’s specifications. CMG SureProof OBA is a 10mil, high quality, resin-coated photobase paper with a universal microporous coating available in satin finish. This photobase paper is designed to provide instant dry times on most high speed, thermal and piezo water-based inkjet printer systems with dye and pigmented inks. Instant dry times reduce production time by eliminating the most time-consuming stage of the workflow—print drying to lamination.